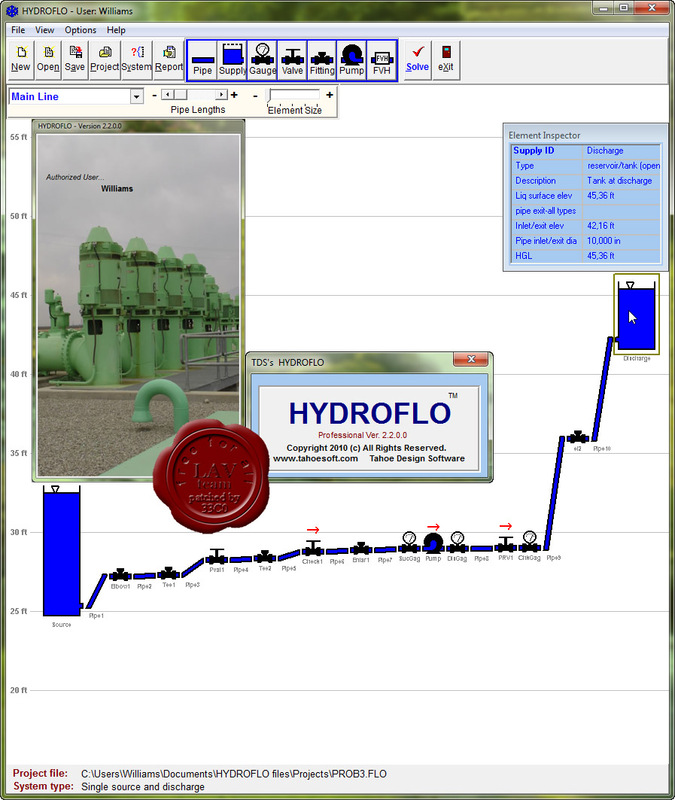 HYDROFLO is a powerful software tool that assists piping system designers in the modeling and analysis of single source/single discharge, re-circulating and gravity flow piping systems. These systems are commonly found in industrial process, water supply, wastewater treatment, fire protection, chemical process, mine de-watering, irrigation and HVAC applications among others. The models created with HYDROFLO can consist of up to 10 parallels and hundreds of elements (pipes, valves, fittings, pumps and tanks). Virtually any type of system element can be described from the wide variety of available elements available on HYDROFLO's menus. Element head losses can be described using flow vs. head loss curves, fixed head loss curves and custom friction coefficients. HYDROFLO models systems conveying any type of incompressible fluid and solves for the full-pipe, steady-state pressures and flows. Hydraulic grade line plots are displayed in the workspace of solved systems so that suction and high-head conditions are easily observed. The Hazen-Williams equation is available for use with water systems and the Darcy-Weisbach equation is available for use with any type of incompressible fluid. Once a system's total dynamic head and flow are found, PumpBase can be used to find the best pump for your application. Systems are built by dragging and dropping both individual or groups of elements onto the workspace. HYDROFLO's new clipboard is available for mass storage, moving and copying of elements. The clipboard can be saved separately from project data, so that a collection of pumps and/or other elements can be brought into any design.Fly-over element inspection (placing the mouse cursor over elements) lets you rapidly identify system components. Elements can be stretched and/or increased in image size for easier viewing. Eleven example problems with their data files are presented in the Help file that depict most of the possible situations that arise in system design. Once a system is built, PDF reports of flows, pressures, line and pump graphics and other operational results can be previewed and printed. Individual or groups of elements can be edited using the new Group Editor. Elements can be "tagged" to assist with editing. 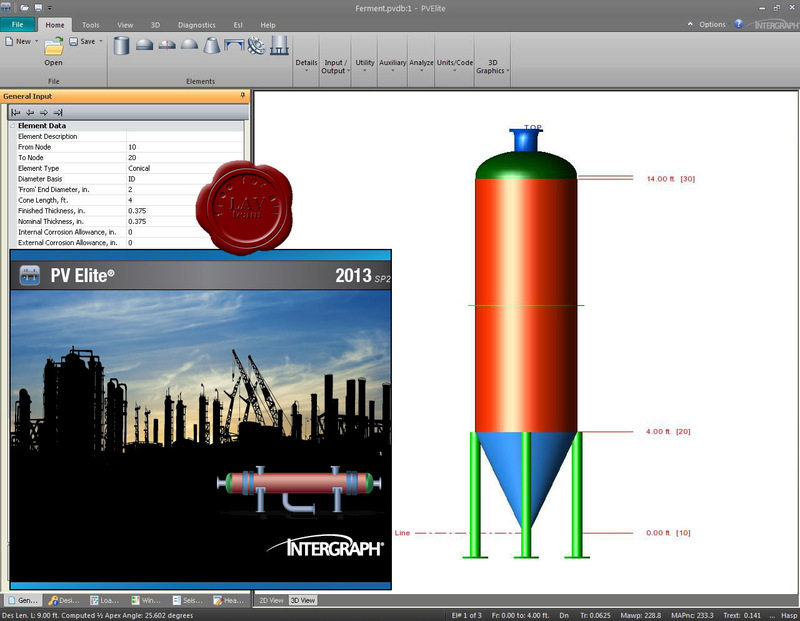 Intergraph PV Elite – наиболее полное решение для анализа и расчета проектируемых аппаратов, работающих под давлением, и теплообменников. PV Elite легко определяет предельное значение давления для сосудов и теплообменников, в том числе при сочетании нагрузок с заданием большого объема данных. Исходные данные в PV Elite собраны в логические группы, что упрощает их ввод. Для получения справки по любому значению достаточно один раз нажать кнопку. Графическое представление расчетной модели в PV Elite помогает определить ошибки в исходных данных и удостовериться в результатах. С PV Elite вы сможете легко и просто просматривать расчетную модель и управлять ей. PV Elite выполняет расчеты в соответствии со следующими стандартами: ASME Глава VIII Разделы 1 и 2, PD 5500 и EN 13445. Также для оценки текущего состояния и остаточного ресурса действующего оборудования используется методика API 579 (пригодность к эксплуатации). Для проверки точности расчетов в PV Elite перечисляются основные уравнения, такие как расчет толщины и максимально допустимое рабочее давление (МДРД); программа также группирует результаты по типу (например, для внутреннего или внешнего давления, для напряжения изгиба, штуцера или фланца). Программа суммирует общие результаты и определяет элемент или узел для контроля МДРП всего аппарата.